Event List, Calendar, byDay Calendar. All with multiple options and configurations. Multiple Payment mode PayPal Integration & "Pay at the door" mode. Multiple Re-Occurrences Create repeating events with lot of options and configurations. Batch generation supported. Multiple Currencies Select a different currency for each event. Coupons Supports deduction by "%"" or specific amount and the ability to deduct from ticket price or from the total price. Gift cards Sell coupons as gift cards. Customers can send them as gifts or use them later. 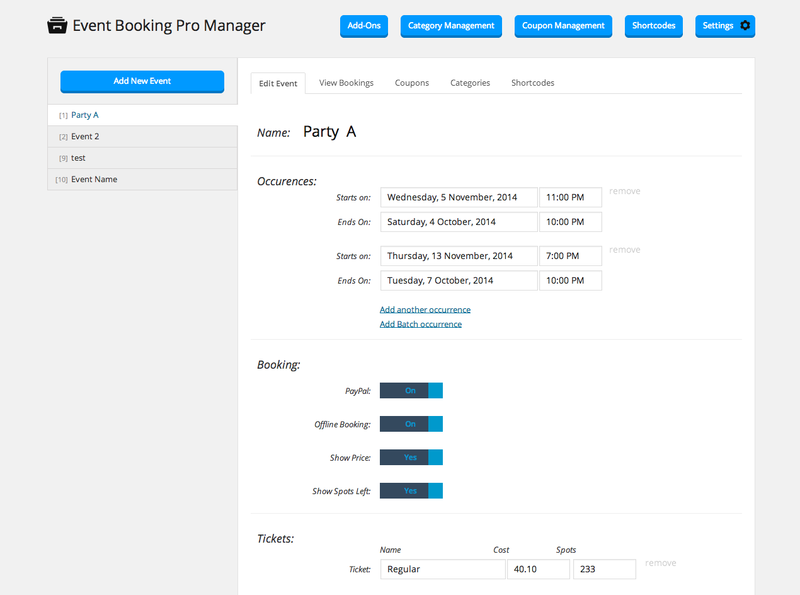 Tickets Create and manage multiple tickets for any event. Limit spots per ticket or per event. Sub Tickets Add sub-tickets to a main tickets. Allows you to create Adults, Children, etc pricing for the same ticket. Quantity Booking Ability to book multiple quantities of a ticket and multiple sub tickets in one go. Success Actions After success booking either show a success popup modal, or redirect to a page or show a message. Add to gCal Add to Google calendar button. 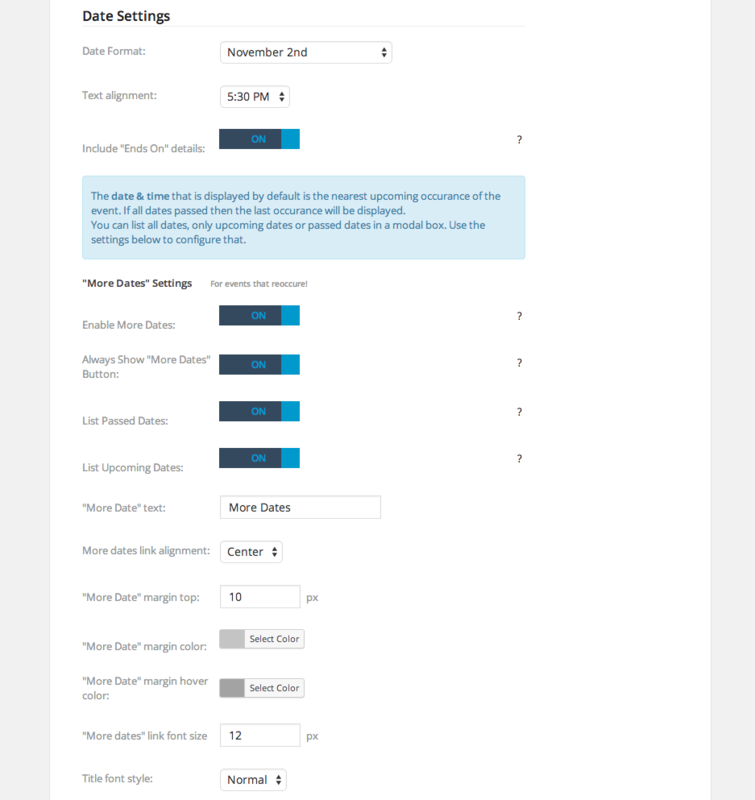 Customizable Emails Full control over the confirmation email and the email the admin receives when a booking occurs. PayPal refund email supported. Extendable with Email addon. Google Maps Easily add locations to your events using Google Maps. Customizable. Visual Editor Easy to use integrated text editor to facilitate description editing. Supports Read-More feature. Featured Image Add custom images for event. Integrated with event box, event card and calendars. Backgrounds Add custom backgrounds for event. Integrated with event card and calendars. Translatable Texts Directly edit all texts from the settings page. Event Categories Create and manage event categories. Create calendars and list events for specific categories. Event Sorting Sort events by date, name or status. Advanced options like show events for next "X" days or upcoming events for a "X" month. Control what is Shown Hide "Spots left", "Price", Coupons", "Quantity booking", "Ending date" and all other features. See Who Booked See who booked the event. 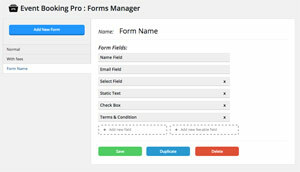 Sort, filter, search, and edit/add bookings using the user friendly admin page. 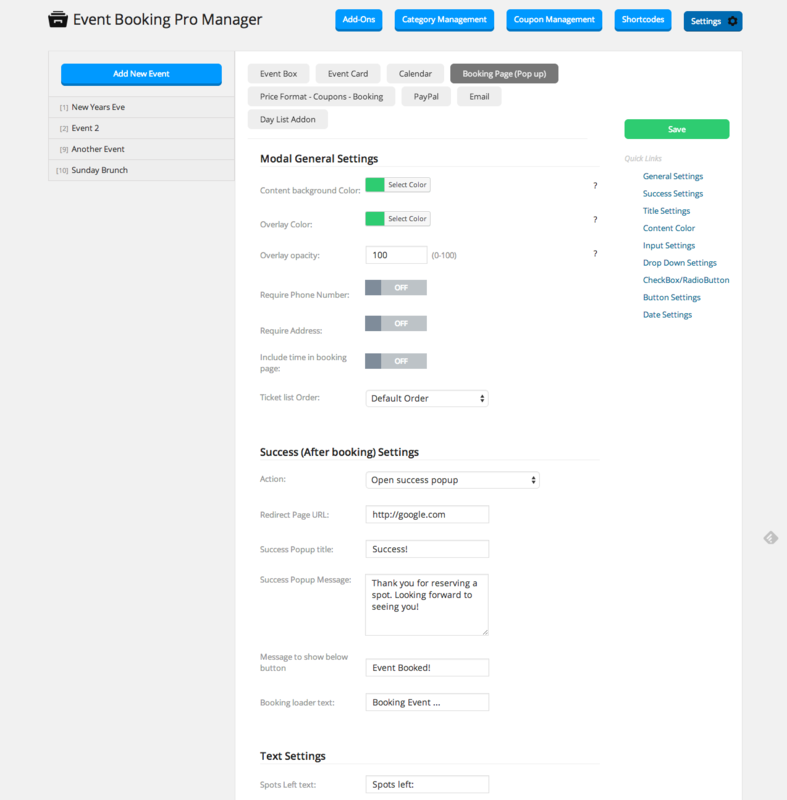 Export Bookings Exports Booking to CSV with one click. Integrated QR codes Requires checkin addon. Fee-able options Add fee-able options to your bookings. Requires Forms Extra addon. ~ 500+ settings and 40 different configurations. Describing isn't as seeing. Try it now!